The Bull Market that started on March 9, 2009. Almost eight years ago to the day we saw the trough of the stock market during the Global Financial Crisis when the S&P500 index closed at 676.53 and the Dow Jones Industrial at 6,547.05. The intra-day low on March 6 was even a bit lower – the very ominous 666 points in the S&P500. Everyone pretty much thought the world would end soon! Screenshot from the WSJ.com on March 9, 2009: The Dow Jones hit a low (6,547.05) on March 9, 2009, and some pundits warned of a fall all the way to 4,000! How bad was the March 2009 trough? From its previous high in October 2007, the S&P 500 index fell by almost 57% and even with dividends reinvested the drop was a still staggering 55%. This drop was even more severe and at a faster pace than the Dot-Com bust in the early 2000s, which was “only” a 49% drop over 2.5 years! In March 2009, the S&P500 fell all the way back to its September 1996 (!) level, so it wiped out 12 years worth of equity gains. S&P500 index 1996-2017: What a ride! The index gained about 250% since the trough, over 300% with dividends reinvested! The eight years brought us very impressive annualized returns: 17% for the S&P500 price index, just under 20% with dividends reinvested and just under 18% when adjusting for inflation! About three times the long-term average! If you lacked a robust stomach you would have missed the best part of the bull market! That’s because the most impressive return came during the first year; about +70% by March 9, 2010. Had we missed that initial bounce, we’d look at a much lower annualized return of around 13.4% with dividends and 11.7% in real, inflation-adjusted terms from March 2010 to now. Still very impressive but only twice the historical average! YoY returns during the 8-year Bull Market. Price Index, vs. Total Return vs. CPI-adjusted Total Return. How does this bull market stack up against others? In the chart below, let’s plot how the current bull market compares to six of his cousins. I picked the stock market troughs of the previous 5 recession lows (lumping together 1980 and 1981-82 as one single event) and also throwing in the May 1932 trough for good measure. I plot 12 years of returns going forward for the historical bull markets, which obviously means there is at least one bear market in between plus the start of the next bull market. Also, I didn’t have intra-month data going back very far so the other Bull Markets starting dates are all at the month-end. 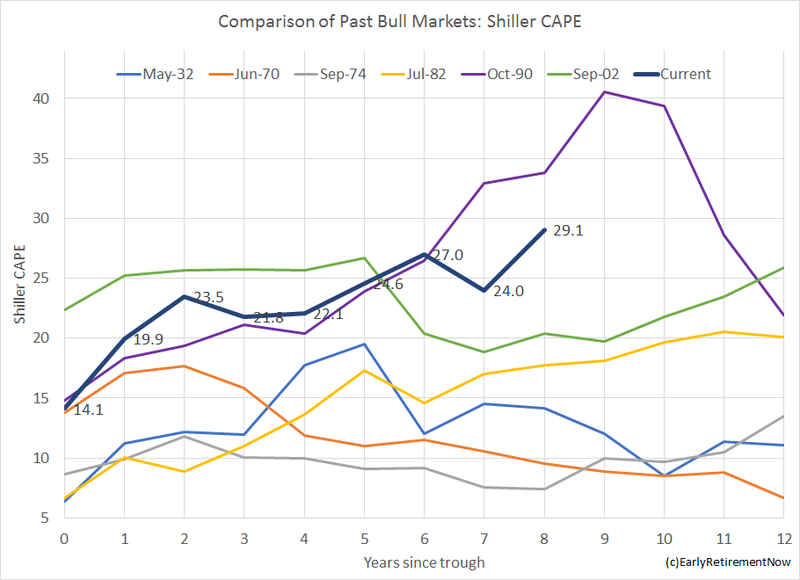 The 2009-2017 Bull Market is about on par with the other three impressive runs that started in 1932, 1982, and 1990. In contrast 1970, 1974, and 2002 were the starting points of relatively short-lived expansions followed by the next downturn after only a few years. CPI-adjusted performance of the S&P500 (including dividends) during seven bull markets. The good news is that there is a precedent of a bull market that keeps going even after 8 years. The 1982 Bull Market faced a slowdown during the eighth year (the 1990/91 recession), but it was a nice short recession without too much of an equity market drawdown (not even visible due to the annual frequency!) and the start of the next bull market (so the years 8-12 of the 1982 Bull market are roughly similar to years 0-4 of the 1990 Bull Market). The most underappreciated Bull Market? According to Gallup, the share of Americans invested in the stock market is still well below the pre-crisis level. Stock ownership took a nosedive after the global financial crisis but started to recover in 2014/15. I guess it took the 30%+ return in 2013 and another solid year in 2014 to get folks back into the market again. But even in April of 2015, the share stood at only 55%, a full 10 percentage points below the 2007 peak. After the tumultuous phase in 2015 and early 2016, the share dropped back 52%, though. And I suspect all those people getting out of the market didn’t sell at the 2015 peak but rather at the September 2015 or February 2016 low points. Retail investors are not the best market timers! Keep going, my friend, keep going! So, everybody, let’s give our friend the Bull Market the respect he deserves. He made a lot of us very wealthy! Happy eighth birthday and we wish you many more healthy years! We hope you enjoyed today’s post. How will you be celebrating this birthday? Please leave comments and suggestions below! Posted on March 8, 2017 March 8, 2017 by earlyretirementnow.comPosted in Asset AllocationTagged Asset Allocation, bull market, equities, finance, personal finance. Wow, BigERN, your stuff is amazing!! GREAT analysis, and helpful to put things in a longer term perspective. The market goes up, the market goes down. Don’t try to time it, and have enough cash set aside (Bucket 1) as you enter retirement to avoid having to sell the dips. Sequence Risk will destroy your Early Retirement dreams. Have a plan to avoid having to sell in a bear, and patiently wait for the bull. For me, given the long legged bull, I’ve been slowly and methodically skimming some profits and moving the gains into Bucket 1 cash. With only 15 months to my FIRE date, it’s not worth getting too greedy. Similar approach here. I have been investing new cash into alterantives (real estate, option trading). But they, too, have some equity correlation. Couldn’t get myself to raise cash (yet). The good thing is that this is such an underappreciated bull market, there is no panic buying, no retail investor frenzy. Maybe this will go on for a while! Thanks for pointing out this milestone. Its been a crazy ride, especially as we seem to hit new highs every day. As a young FIRE Family, I wish the market would correct a bit so we could buy in lower, but congrats to those able to cash out a bit as they edge into ER. Ha, good point. That’s the other side of the medal. If you’re still years away from FIRE you obviously hope for a correction and a good buying opportunity! How does one determine the start and end of a bull market? e.g. why didn’t the European debt crisis count as the end of that bull and the end of the crisis be the start of the next bull? Is it a duration thing? Or the depth of the dip? Great question. There might be a textbook definition somewhere. I seem to remember bear market = -20% from top. From that bear market bottom the next bull market starts until we get another 20% bear. In my study I simply took the low-points of the equity market during or around the U.S. recessions. I don’t like rigid rules. Maybe the 2011 would qualify as another bear market (certainly for small cap stocks). 1987 could be another bear market. But they were all without a recession and quite short-lived. How come there’s no drop in 1987? Was the drop in October short enough to never show up in the year on year chart? There was a drop of 15% between years 5 and 6 (=July 87 to July 88). But the data at annual frequency do hide the big drop of 30%+ in the Fall of 1987. Interestingly I started investing in 1996 as a teenager, so I went through that time of zero returns (aka the lost decade). In the long run hopefully that will have been a good thing financially, because I went through two huge crashes early in my investing life. I can remember both crashes vividly, and lost a big percentage of my investments both times. But I held on, and that financial base developed during the lost decade has been on a tear since 2009. So I have the lucky (?) experience of seeing my investments go down over 50% and still not selling out. Given this, another bear market or huge decline doesn’t scare me. Haha, great point! That was a good experience in hindsight. Teaches us not to overreact if there’s a little bit of volatility. Brexit? What Brexit? And I’m sure if you check your personal Internal Rate of Return (IRR) you’d have done better than the index since 1996 because you were able to u some bargains along the way! In this recovery, GDP growth has been growing slower for longer which has supported the pretty solid stock market performance. I’m curious how GDP growth this bull market has compared to the others. Main street seems to be pretty stable, but Wall Street has been frothy the last 5 months no doubt. I can only see the recent rise supported by action in Washington…which has been known for anything but action for years now. We’ll see what happens. Great question! This current recovery had only about 2% GDP growth. 1982 had 5% average growth for the first few years. 1982-2000 had 3.7% average growth (with another small recession in between). It’s no comparison. But in defense of our current Bull Market I’d have to add that March 2009 was such an overreaction on the downside. People were pricing in a Great-Depression-repeat. But I agree: Currently, the S&P is priced for perfection. If everything works out not as well as planned we could see some downside risk. Nice study! That gives some context around this bull. Since I joined a startup, we have been hoarding cash due to the uncertain nature of my job. Recently, we funnelled that into option writing, rather than on a savings account. We will keep doing that for a while. The focus is EU DGI stock that I deem ok to hold. That means I expect the dividend to be sustainable and the return to be above 2,5pct after tax, without chasing high dividend yield. The point I keep coming back to is 1996. Greenspan irrational exuberance speech. Cape and standard p/e were both higher then today. And yet on an annual basis you returned a positive return by staying in he market even from that point through to 2009. It really rams home the point that even if the market is overpriced, that doesn’t mean you won’t make positive returns from here. Imagine if tomorrow all those people on the sidelines jumped back in the market… what would happen to p e then? I simply am staying the course with one minor tweak, I’ve added a bit more tilt towards inflation protected assets like reits with new money. Even that though is an adjustment barely register able from a return perspective, it’s more psychological in my case. Exactly! That’s’a great point. People scared about a CAPE in the high 20s would have missed the gains between 1996 and 2000. Cheers! I graduated college in 95. It is rough beginning to save money and seeing some results from investing, but then it all plummets 8 years later, then it comes back some, then it plummets once again 5 years later and all of your savings are just savings. I had been investing over 13 years and had hardly any profit. The graduates of 09 must love investing. I know! Some of me best investments are from that time when the market dropped and I could pick up equities for bargain prices!